Human babies first learn to walk when they are an average of a year old. Some are able to stand and balance tentatively on two feet from the age of about 9 months. As we go through life, we take being able to walk upright completely for granted and some people become highly skilled at balancing, able to walk a tightrope or cycle around on one wheel. In later years, when the body is ageing, walking can become more difficult. Not only do joints, bones and muscles suffer the effect of ageing, the debris can also start to build up in the inner ear and nerve conduction efficiency can be reduced, leading to age-related positional vertigo. How Does the Inner Ear Help with Balance? The part of the ear that is crucial for balance is inside the inner ear. 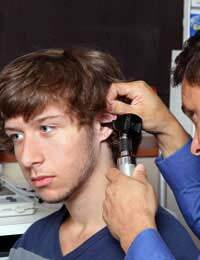 In addition to the apparatus that transmits vibrations from sound waves from the ear drum through the anvil, hammer and stapes bones to the hair cells in the cochlea, the inner ear also contains the semi-circular canals that form the Organ of Corti. The semi-circular canals are filled with fluid and each canal is a horseshoe shaped tube that is oriented at right angles to the others. This enables the canals to send signals to the brain to let it know whether we are standing up, leaning over, lying down or even upside down. At the end of each semi-circular canal is a widened end that is lined with very sensitive hair cells. These are not involved in hearing; they transmit messages to the brain about the way the head is moving. When we turn our head, the fluid in the canal flows in a different direction. The movement stimulates the hair cells and signals arrive in the brain to communicate the sensation of movement. The utricle and the saccule are also important. The hair cells in this part of the inner ear are encrusted with small calcium deposits – the otoconia. The stones are set in jelly, so they are very free to detect any movement and changing the angle that we hold our head causes them to press on nearby hair cells, setting up impulses to the brain. When we are upright, sensors within the limbs and main part of the body also feedback information to the brain and these, impulses, together with the state of the hair cells in the ear allows the brain to know whether we are upright, whether we are moving, even in a straight line, and helps us maintain balance. Walking in a straight line seems easy but many body systems have to work together to let us do that. The eyes also play a role – visual information from the horizon and the objects around us feed in to the brain through a separate route. The system to control balance and posture is complex and because information is coming from three different sensory systems – the body, the eyes and the ear – there is plenty of scope to confuse the brain. This confusion usually makes us sick, literally. If we travel in a boat on a fairly choppy sea, for example, the motion of the body, the chaotic movement of fluid in the inner ear and the conflict with information coming into the brain from the eyes creates the feeling of intense nausea. The same thing can happen whenever external movement becomes excessive – such as a bumpy coach journey or a space flight. People recover their ‘sea legs’ after a few days under these conditions because the inner ear adapts to the constant motion but this accommodation effect is not foolproof. Even regular sailors can become sea sick during a violent storm.The loss of balance during old age happens because the hair cells in the utricle, saccule and in the bulbs of the semi-circular canals start to die. They cannot be replaced. Also, debris can build up in the fluid inside the canals, and this can damage large tracts of hair cells, or at least cause them to fire unexpectedly. This causes sudden vertigo and dizziness, which can lead to older people having falls. How Well Do You Know Your Ears?